Before I launch into a detailed compare-and-contrast exercise based upon Tilley’s interpretations of cross dykes, I want to take a step back and make a comment about the pictorial quality of his published books. At the same time as buying Interpreting Landscapes, I also bought his influential 1994 work A Phenomenology of Landscape. My primary motivation to do this was its description as “an extended photographic essay”. I’ve been a keen photographer for years and my early fascination with archaeology and landscape was stoked by the beautiful images of British ancient monuments produced by Homer Sykes and Mick Sharp. More to the point, I would argue the medium has been both under-appreciated and under-utilised in archaeological research, save perhaps for the usual selection of a “nice” photograph for the front cover of a book. It came as something of a disappointment, therefore, to find that the photos are reproduced in grainy, monochromatic form throughout A Phenomenology of Landscape. In the majority of cases this does not detract (or distract) from the point or points which a given photograph pertains to, but there are a good few where the quality is too hazy and/or dark for its particular significance to be adequately appreciated. Anyway, back to the Hog’s Back and Cranborne Chase. My main frustration with assessing “seven ditches” is the fact that there would seem to be know way of knowing precisely what the earthworks were. Reading Tilley’s chapter on cross dykes – beginning with his and others’ comments that they rarely follow simple, straight courses (e.g. Tilley 2012, 136-37) – got me thinking whether there might be a chance it remains fossilised in the present landscape. The line of the parish/Hundred boundary descends straight down from the summit of the ridge for 100 metres or so, but then deflects slightly from this course to head due south. (This can just about be seen in the photo below.) The latter orientation happens to align with the head of the Cutt Mill stream (the watercourse has no official name; locally, it is sometimes referred to as the Holybourne, but a late eighteenth-century reference to “Hollowbon Copse” recommends it derives from OE hol-burna, “stream in a hollow” rather than something holy). Tilley notes a number of cross dykes which run from the top of an escarpment down to the edge or interior of a “coombe”. He follows this up in his concluding observations by interpreting them as having a deliberate downward viewpoint, linking open, dry ground with the “interiorised world of the coombes” (Tilley 2012, 177 – some of his subsequent interpretations in this regard are perhaps a little OTT). It has been many years since I have poked around in the hedgerow to check the physical form of the boundary running south from “seven ditches”, but the indirect line it takes as far as the spring or edge of its “coombe” (obscured somewhat by the creation of the upper carriageway of Hampton circa 1800) corresponds with the aforementioned pattern and as such invites further investigation of the strength of the connection. Tilley’s choice of Cranborne Chase, rather than one of the other areas where concentration of cross dykes are to be found, is fortuitous since it is the site of the only other English “seven ditches” place-name I know of, on the estate/parish boundary of Sixpenny Handley. However, Tilley (2012, 127) makes the important observation that cross dykes are limited to the chalk ridges of the northern half of the Chase, and Sixpenny Handley lies outside of this area to the south. I’ve long wondered if there was a way of (re)locating “seven ditches” in the present landscape but, being very much a non-local, had largely given up hope of doing so. However, after an inconclusive afternoon of flicking between the glossed bounds of S 630 in which the name seuen diche first occurs and maps of the locality, I came across this plotting of the boundary points using Susan Kelly’s interpretation of them from her 1996 work The Charters of Shaftesbury Abbey which would appear to confirm A D Mills’ correlation of the boundary mark with the linear earthwork marked as “Dykes” on early OS maps such as the one in the screenshot below. In fact, it would be more accurate to locate “the gap at the southern end of seven ditch[es]” somewhere in the vicinity of Canada Farm on the northern edge of Gussage St Michael parish, and the subsequent description of the boundary running anlang diche (“along the ditch”) as coincident with the “Dykes”. Befitting the testimony of the charter bounds, an earthwork runs north-west from Canada Farm (unnamed but just to the right of centre in the map excerpt below), following a curving line for approximately 500-600 metres to a point on the other side of the A354. The nineteenth-century map furthermore suggests there was a second earthwork running more or less parallel to it on its western side – potentially accounting for the name “seven ditches“. To the north, an irregular field boundary beyond hints at it having extended much further, perhaps terminating in the vicinity of Chapel Down Farm in Sixpenny Handley parish. This identification would also complement the early seventeenth-century reference to the earthwork as being remote yet in the vicinity of Monkton Up Wimborne (for which see my first “seven ditches” update post). “Seven ditches” was (and is) here? The fact “seven ditches” in Dorset may survive as an extended linear earthwork means we have a possible extant monument with which to compare with its Surrey namesake. Both occur(red) in areas not known for cross dykes, though given the tiny sample size the robustness of this point is open to debate. Nevertheless, on balance, Surrey’s “seven ditches” was almost certainly not a cross dyke, or at least not one in the mould of the cross dykes of northern Cranborne Chase; further reading on those of the South Downs of Sussex, subject of several scholarly articles, should reveal whether or not they are a more valid parallel. That said, “seven ditches” did resemble the cross dykes of Cranborne Chase and elsewhere insofar as it was by implication a linear earthwork or earthwork complex atop a chalk ridge. Its orientation is unknown; there is just as much chance the ditches ran parallel to the ridge line as perpendicular to it (this of course has implications for the viability of a pre-historical ridgeway along the Hog’s Back). Nor is there any way of saying exactly where the earthworks were. However, on this point, it is beyond question that they must have lain on a high point of the ridge (by contrast, the Dorset “seven ditches” follows the 80 metre AOD contour, some way below the top of the Gussage Hill ridge) . Only by visiting the site do you perceive how the ground slopes away ever so slightly to the east and west. If the Hog’s Back ridge is thought of as a blank canvas, then it is surely no accident that the “seven ditches” were inscribed onto it at this point rather than to the east or west. Was the existence of the spring at the head of the Cutt Mill stream to the south – low/wet as opposed to high/dry – influential in the selection of the exact site? This may depend if the spring was germane to the original function(s) of the site or not; Tilley concludes cross dykes in Cranborne Chase were “ritual works”, specifically “processional routes” (Tilley 2012, 182), and it should not be forgotten that there is positive thirteenth-century evidence for a track between the vicinity of the spring and “seven ditches”. On the other hand, the lost Surrey earthwork may have come into being for considerably different reasons. We have a similar, if rather less proximate, affinity between the site of “seven ditches” on the Hog’s Back and an earthwork of presumed but unproven Late Iron Age or Romano-British date, the “hillfort” at Hillbury on the Lower Greensand ridge due south – see the satellite photo below for a depiction of their locational relationship. My hunch is that Hillbury was a “pioneer” settlement established in the twilight years of the hillfort-building tradition at the end of the pre-Roman Iron Age to develop greater arable and pastoral exploitation of the locality. Part of this could have entailed the establishment of a number of extensive land divisions, either by the creation of new boundary-type earthworks or the adoption of pre-existing ones. There is a linear earthwork in the form of two parallel ditches running from a point north-east of the “hillfort” defences northwards towards – but petering out some distance from – present-day Robert’s Moor and Totford Hatch. Hillbury and “seven ditches” are highly inter-visible from one another, so it is possible the latter may have come into being as a prominent (perhaps even symbolic) means of demarcating the edge of the economic territory associated with the settlement (if that’s what it was) at the western edge of the Hillbury ridge. The area between “seven ditches” and Hillbury. North is to the top of the page. The group of tents on the left-hand side of the picture is the set of Russell Crowe’s recent ‘Robin Hood’ film. To summarise; although a number of interesting questions have dawned on me when evaluating Tilley’s interpretation of cross dykes (Are any of the cross dykes on boundaries described in Anglo-Saxon charters? If so, how are they described? Do they have proper names like “seven ditches”, or are they referred to in neutral terms? 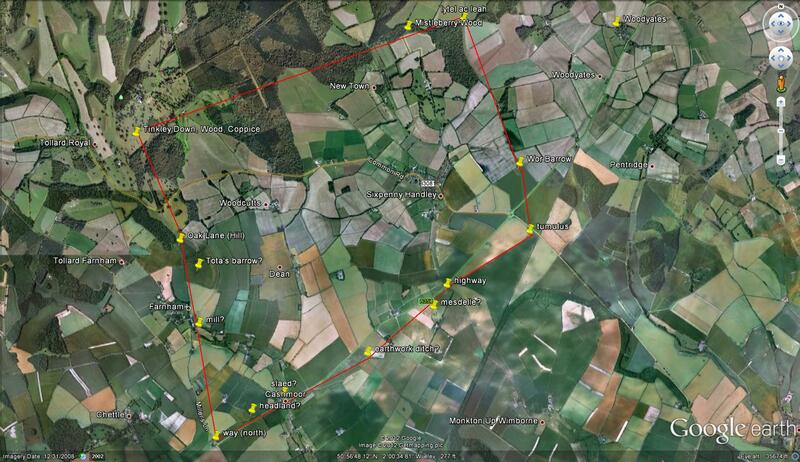 ), they would not seem to be of relevance to the assessment of the “seven ditches” earthworks of Surrey and Dorset. In the case of the latter there is good reason to believe that it survives substantially intact in the present landscape; a trip to this unassuming corner of Dorset for a spot of phenomenological fieldwork may yield further insights about its form, stature and setting. In particular, seeing the earthwork(s) at close quarters may begin to answer the question of the meaning of the appellation “seven ditches”. Was it a literal, numerical description or something more abstract? If it was the latter, was “seven” religious or secular in implication? Did this stem from a significance that was immemorial, or one that had arisen as a consequence of appropriation in the post-Roman/early Anglo-Saxon centuries – hence the Old English constitution of the names? Or, after all of this, might it in fact be the case that the motives for the coining of the two names were entirely different and the synonymity of the two sites nothing more than coincidental? As Tilley (2012, 146) says of cross dykes, “highly specific interpretations” are needed of monuments in different areas and the same might very well apply here too.